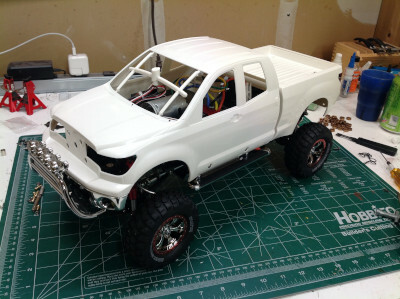 I have previously built another truck in the Highlift series, the Ford F-350 . Since I already wrote about that build in detail and this build is nearly the same, please check that page for more detail if desired. This page will focus on the differences. 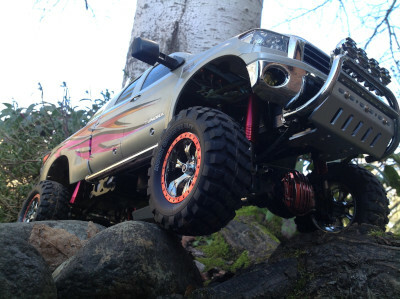 The High Lift series of ultra-realistic solid axle truck kits was first released in September of 2006 and the 58372 Ford F-350 was the first version. 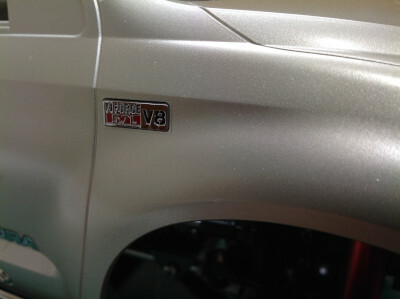 The 58397 Toyota Hilux would follow in 2007 and the 58415 Toyota Tundra in 2008 along with a range of pre-painted versions of each. All the base versions have been available continuously since. 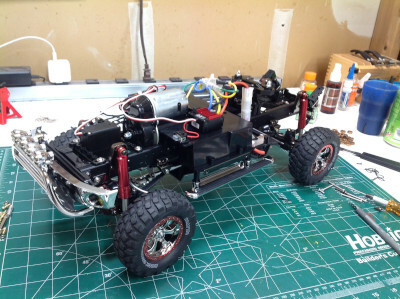 This is a 4WD solid axle chassis with steel ladder frame construction and leaf springs. It features a 3-speed transmission which is highly based on the version from the 1/14 scale tractor truck series. 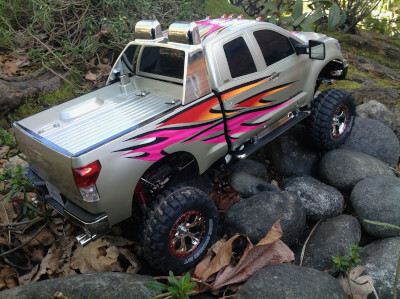 Each of the truck versions has different wheels and slight variations in the frame for mounting positions. The detailed hard shell body includes light buckets, a roll cage, and an optional roof rack for snowboards. The body does not need to be removed for battery access. 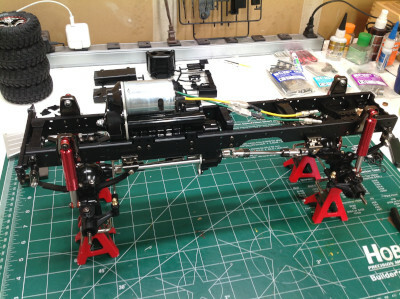 Instead, the bed can be tilted back to access battery tray which sits sideways under the chassis rails. The kit includes "friction dampers" rather than oil filled shocks. They are less effective but look good and are perfectly adequate for this kind of speed. The kit also has a four wheel steering option, but to me this makes no sense on a scale truck so I didn't use it. 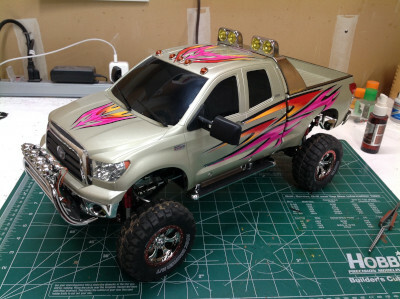 This was designed to be able to use the MFC-02 Multi-Function Control Unit which adds many lights, a vibration motor, and V-8 (or V-6) engine sounds. Naturally I chose to incorporate this option. Since I already own the F-350 High Lift with the MFC, I decided to configure this truck to use the V-6 sound (even though the badging on the side of the truck says V-8). 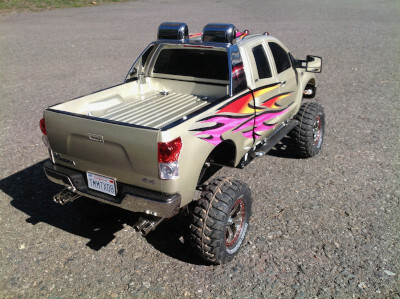 I don't plan to get the Hilux since it uses the same body as the Bruiser which I already have. 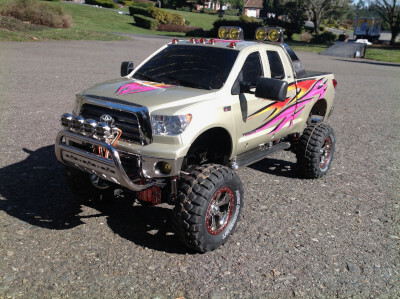 The primary selling point of this truck is the appearance. With a silver can motor it is not very fast even with the 3-speed transmission. With open differentials it is not that great off road, although the diffs can be locked manually by inserting a set screw. The leaf springs don't offer much articulation, and the ground clearance is terrible with the transfer case hanging way down below the rails. So why bother? Well, it looks great. With the MFC added, it also sounds great. You have headlights, fog lights, roof lights, turn signals, reverse lights, a horn, and engine sounds. I wasn't crazy about the rather plain appearance of the model if done as per box art. I like the champagne gold color, but it was just lacking something. The kit comes with a set of flame decals, but they really only work with a dark color. I decided to order one of the 3 sets of add-on sticker sets Tamiya released at this time. I think the "tribal" stickers look pretty good, although certainly they are a bit much and probably not for everyone. I also painted the differential covers and beadlock rings in metallic red and installed the optional rooftop lights. 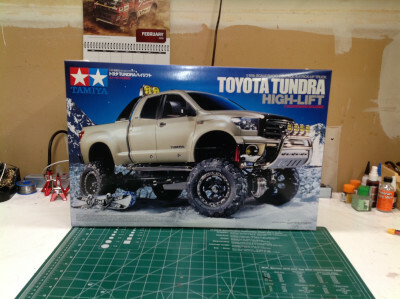 The Tundra comes in a huge box with a photograph rather than traditional box art on the cover. 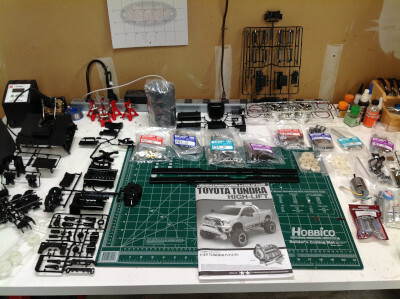 The contents are carefully presented as per usual for Tamiya, but without the extra bling of any blister packs. The majority of the hardware and the motor are in the small box on the bottom right. I've arranged the parts needed for the chassis which are enough to fill my build table. The parts for the body are in the box until I need them. The main thing to note here are the metal chassis rails which are actually different than the F-350. They include multiple hole locations for the transmission and the leaf springs are a different length. The transmission is exactly the same as in the F-350, but I couldn't resist taking some more pictures just because it is so cool. 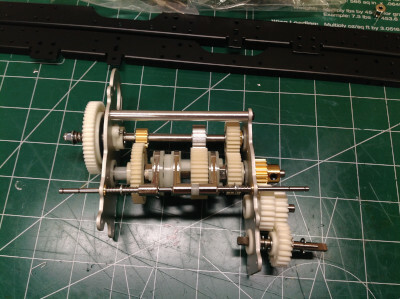 Gotta love all those pretty gears. As usual, I did swap out all the bushings for ball bearings. 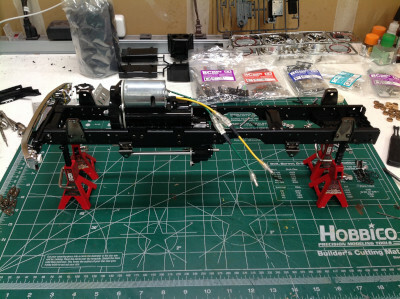 On the right you can see the motor and transmission installed on the frame rails along with the cross members and suspension mounts. The front bumper is also mounted directly to the frame. The front and rear axles are very similar to those on the F-350 but the differential covers are different. They are chrome plated but I painted transparent red over them to somewhat match the red anodized shocks. The leaf springs are very hard but they tend to soften as they break in over time. 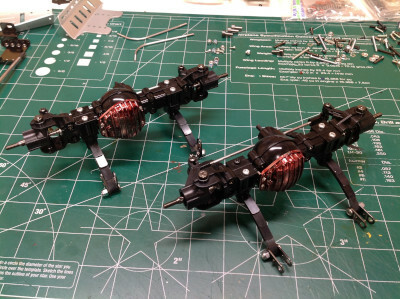 On the right the axles and shocks have been installed completing the suspension. Now I've installed the wheels and tires. The tires are the same as on the F-350 but the wheels are different and include faux beadlock rings which must be glued to the wheels. I painted them with trans red like the diff covers and am happy with the look. 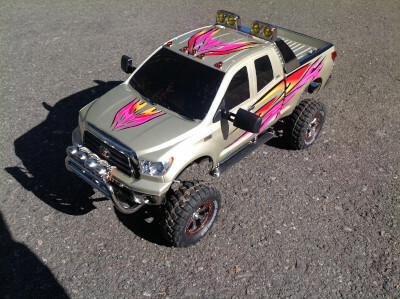 I plan to install the MFC, but at this point I've installed a temporary control system to try the truck out. 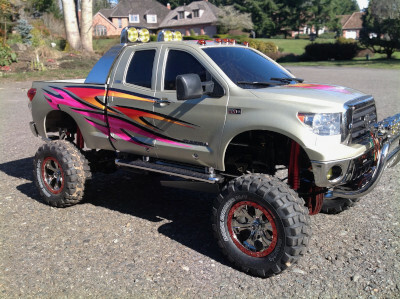 The battery access is a little different than the F-350. 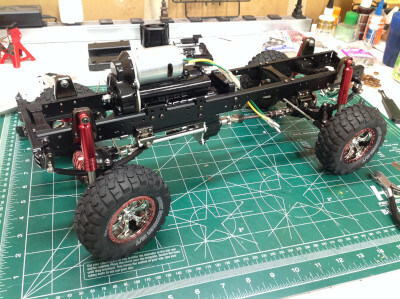 It is still mounted under the chassis behind the transmission, but because the body is mounted higher you don't need to tilt the bed to access it. Instead the left hand running board can pivot out of the way allow battery access. The running board is held in place when stowed by a magnet. I've also installed the front bull bar here along with the 4 fog lights. 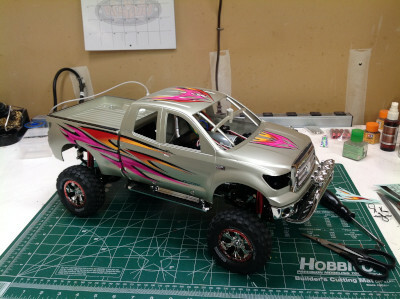 The vast majority of the body is comprised of only two parts which makes it very easy to set them on the chassis and get an idea of how this truck is going to look when finished. The left hand image shows the unpainted body parts. On the right, I've applied the champagne gold paint, the stickers, and the clear coat. The grille is sitting in place but not yet attached. All the details are yet to be added. 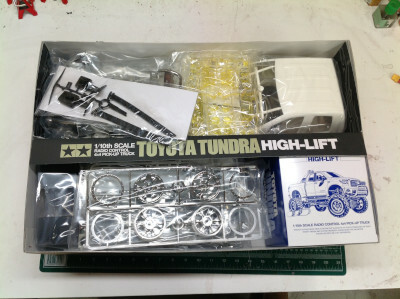 There are only a handful of decals that are used per the instructions and they include things like the Toyota logo on the grille and some markers. For these V8 side markers, a metal transfer is but over the top of a sticker. 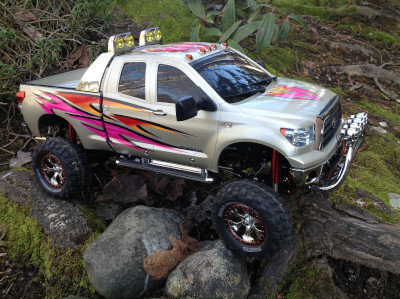 There are several optional ways to finish off the truck per the instructions, and the optional parts are present in the box. One option consists of 5 marker lights on the roof above the windshield. You have to drill holes in the cab to put LEDs in them, so once you decide to use this option there's no going back. I like lots of lights, so I installed this option. There's also a roof rack with a pair of snowboards as pictured on the left. 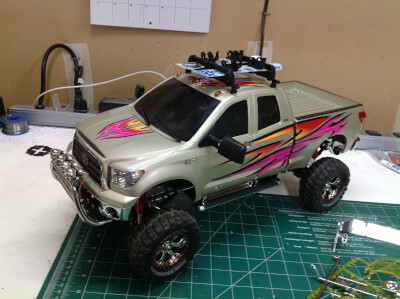 It was original plan to use this option because I think it really makes this truck different than my others, but in the end I was not happy with the colors on the snowboards and how they clashed with the tribal decals on the body. I also didn't like that use of the roof rack means you can't use the roll bar. I removed the rack and went with the roll bar instead. It is worth noting that the side mirrors are rubber which makes them resistant to rollover since they can bend out of the way rather than breaking. I've documented installation of the MFC-02 before, so here I'll just show a picture of the completed install. The speaker is between the frame rails in the back with the vibration motor immediately to the left, followed by the control unit itself. In this picture only the lights which are part of the chassis are shown. The rest of the lights are installed in the body. 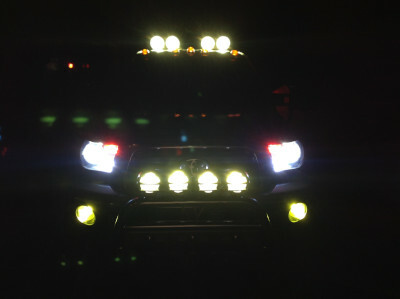 Note that the MFC does not come with enough lights to install the bumper lights and the four front fog lights and the five roof lights and the four roll bar lights. I added the roll bar lights which I purchased separately. With the high beams and the turn signals, there are 21 forward facing lights and 6 tail lights. This is a really good looking truck. 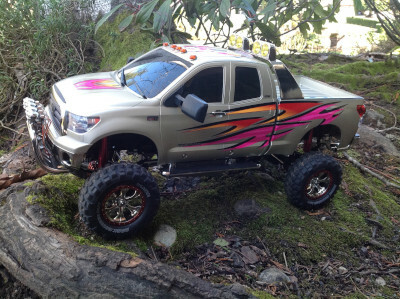 Like it's F-350 brother, it suffers from marginal articulation and ground clearance but makes up for it in panache. 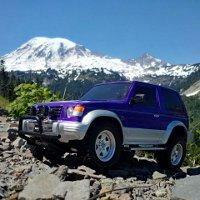 Off road performance can be improved by locking the differentials, but at the expense of on road high speed stability. I chose to leave them unlocked. The tinted windows and MFC preclude use of an interior, but the model still looks excellent. 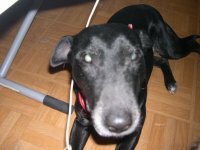 I love your lighted picture. Can you put thr roof rack and the upper lights in the same time? Yes, you can do the 5 roof lights and the snowboard rack at the same time.